Morgan Stanley stock strategists, among the Street's more bearish, have been expecting more downward earnings revisions and, in fact, they see an earnings recession. That recession could also be followed by a mild economic recession, but the analysts say there's no need for fear and investors should "embrace it." The bad earnings news should help drive another correction in the market, which would provide a buying opportunity. Traders work on the floor of the New York Stock Exchange, December 28, 2018. 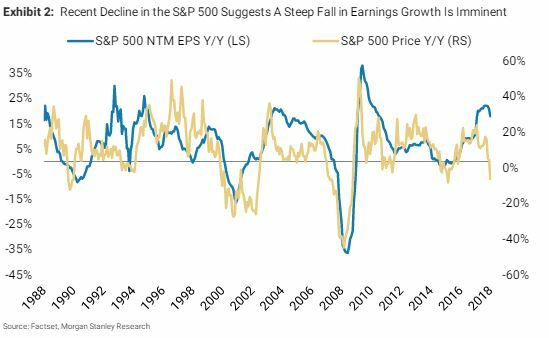 Morgan Stanley equity strategists believe the stock market priced in an earnings recession when it plunged to December's low, and it is very likely to retest that level. But the strategists, led by Mike Wilson, also say in a note that there is nothing to fear in a potential recession, and investors should "embrace it." As earnings revisions come down, the analysts expect the S&P 500 to fall back to the lows, and that would be a time to buy. To play these next moves, Wilson and the strategists warn investors that the S&P should hit resistance and they should lighten up if it gets to 2,600 to 2,650. But once the market responds to the worsening earnings picture and returns to recent lows in the 2,400 area, investors should jump back in and buy cyclical names. "While there was a confluence of technical factors that conspired to create one of the worst Decembers in history, we also think the market embraced our earnings recession call as earnings revision breadth rolled over. In short, the market is discounting our out of consensus views on growth and it may have even discounted a modest economic recession," they wrote. The strategists, notably among the Street's most bearish, also say they had expected to see the S&P 500 touch the 2,400 level but not until the first quarter of this year. The S&P reached an intraday low of 2,346 on Dec. 26 and has since risen about 10 percent off those lows. The risks are getting higher that the earnings recession could become an economic recession. "Risks are rising, and we don't have a crystal ball but we also don't really care about such an outcome if it's already priced," they wrote. The strategists say they don't know if a recession is coming but the economics team at Morgan Stanley is modeling in a severe drop in GDP growth from 4.2 percent in the second quarter of 2018 to just 1 percent by the third quarter of 2019. "While that's technically not a recession, that kind of deceleration will feel like a recession to the market and will help our earnings recession call come to fruition — which is really what matters to us, and the market. In other words, by the time investors figure out we are in a recession it may be too late to do anything about it and, quite frankly, it's more likely time to buy than sell," the strategists noted. The slowdown in manufacturing data is also something that has foreshadowed an earnings recession, and they expect the ISM survey to break below 50, a sign of contraction. "Once again, such a collapse in manufacturing PMI would provide another reason for the re-test of the lows and a time to buy, not sell," they wrote. Another sign of more economic weakness is the move in fixed income markets. The market had been pricing three Federal Reserve interest rate hikes but by early January was nearly pricing in a rate cut. If the hard economic data deteriorates, the strategists expect to see the weakness reflected in expectations for the Fed.